Picture the scene; it's the middle of both a post-apocalyptic zombie invasion and the worst winter in recorded history, you're running low on everything from food to medicine and you come across a horse. A horse would be very useful for getting around town quickly, it's a majestic beast and for one to have survived this far into a zombie outbreak means it's a fighter, but it also represents a significant quantity of fresh protein and there's plenty of starving mouths to feed back at the colony. So what do you do? This kind of decision is at the very heart of Dead of Winter, it's the crossroads element that turns it from a mechanical cooperative game of survival into a story. These difficult, morally ambiguous decisions don't come up as often as they should, but when they do they're often agonising. What did we do? Let's just say it was Findus Lasagne all round. Dead of Winter is a Stephen King story in a box, many people reference the Walking Dead but for me Dead of Winter feels more like The Mist but with zombies instead of trans-dimensional beings and blizzards instead of mist. The survivors are holed up in the Colony and now have to venture out to find food, medicine, fuel or whatever the latest crisis to befell the survivors requires. And in its simplest form this is the base of the game, moving characters between being locations, scavenging for resources and holding back the tide of undead. Travelling around the town and fighting off zombies is fraught with danger whether it be the ever present cold weather or the flesh eating dead and this is where the red die comes in, one of the biggest bastards in gaming since epidemic cards. There's a good chance that you'll make it out of the colony without a scratch, there's also a good chance that you'll take a bit of damage or maybe even catch frostbite, but there's a 1 in 12 chance you'll get bitten, and then things start to get interesting. A zombie bite means instant death for the snack but there's a risk the zombie infection will spread and other characters at the same location must choose to either take their own life and stop the spread of zombies or take their chances and roll that git of a red dice again. The problem is when rolling for infection is that any wound marker, not just the tooth, causes the virus to spread. It leads to potential cascade effect where a single zombie getting into the colony can cause untold carnage. It's an amazingly thematic mechanic, not only does it make every journey across town and every fight with a zombie a genuinely tense experience it also brilliantly recreates that one scene from every zombie movie where a character realises their best friend has been bitten and the antagonising decision of killing them now or hoping it all blows over. Even with just these mechanics Dead of Winter would be a solid cooperative experience but it adds a few things to the mix that elevate it even further. I've already touched upon the Crossroads cards, triggered events that give the active player, or a group vote, an agonising morale decision that often gives a reward but at a cost to the group. But then there are the secret roles that take the game to another level. Each player is issued with a secret objective, their own win condition. These often involve beating the scenario as well as completing a mini objective, such as collecting a number of books or hoarding food. These objectives all make the players look suspicious, seemingly acting against the interests of the group and this is important because there's the slim possibility that one of the players will be a betrayer. I say slim, because in six games I have never had a betrayer at the table. Everything all pulls together to make Dead of Winter a big draw in my group. 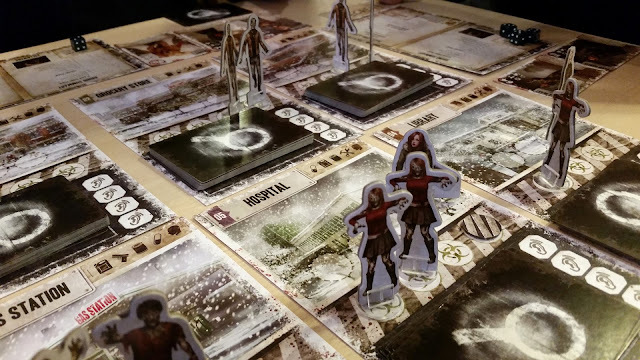 Dead of Winter uses zombies in a very thematic way, they are core to the game rather than just a thrown in antagonist and this makes it my favourite zombie game. 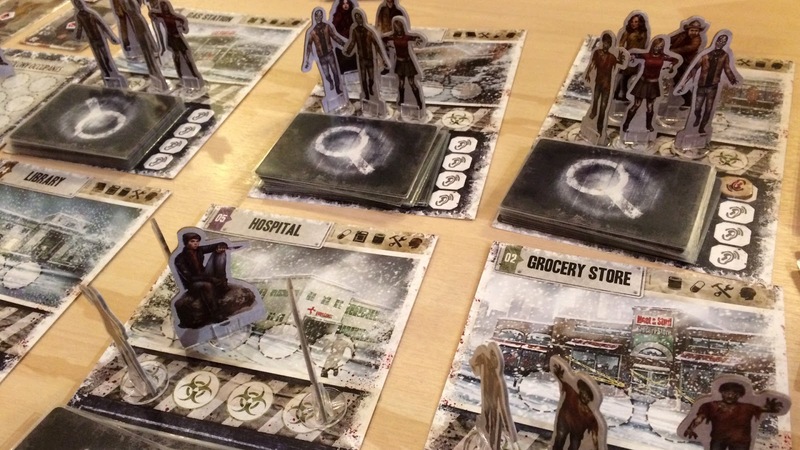 Even if you're suffering from zombie fatigue there's a lot in Dead of Winter to keep you interested. Whether it's the stressful cooperative element of desperately trying to survive, the hidden traitor game or the innovative crossroads cards that transform the game into a storytelling experience there's a lot here to take it beyond the simply 'yet another zombie game'. It's because of this that Dead of Winter has become one of the core games in my play schedule, while it might not come to the table every week, it makes several appearances each year, and for me that's the greatest praise I can lay on any game.